Most people don't wash their cars any longer. A while back it was different, as only a select few garages and businesses could afford those big automated machines. Now due to the high overhead costs these car washes had, prices were pretty high and people opted to wash their cars at home. Another problem is that these machines tended to scratch your car. Don't know if that's been remedied yet. People wanting to start a car wash business said "to hell with the machinery" and just hired a couple of helpers willing to work for a low wage. Strange that things happened in this sequence but that's life. Costs were down and suddenly car washes were cheaper. 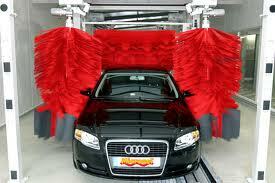 Today there are more manual car washes than automated ones. Our weekends are more precious now that life is more frenetic and busy than ever. You want to rest and spend as little time and energy on things like washing your car and even giving your dog a bath. People are willing to pay money if someone can take these administrative hassles off their hands. What I've also found is that a good car wash can do a better job of cleaning your car than you as a normal civilian can, plus they take a third of the time to do it as they have a swarm of people simultaneously cleaning your vehicle. Convenience is worth more than ever in today's world because time is becoming more scarce as work consumes more and more of people's lives. More people now pay to have their cars washed, pets groomed, gardens cleaned and events planned. It doesn't matter if your costs are $2 and you charge $12: as long as your price is competitive and you offer convenience, people will gladly pay you for freeing up their time.